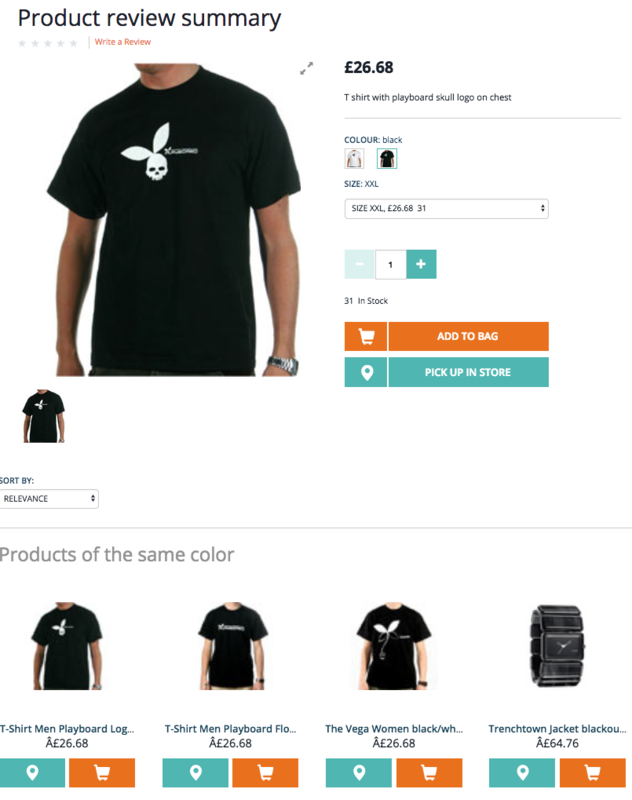 When you search for a particular product, words are often not enough to find exactly what you need. Sometimes it is easier to deal with the products similar to the one you like. It is especially so for the fashion e-shops. 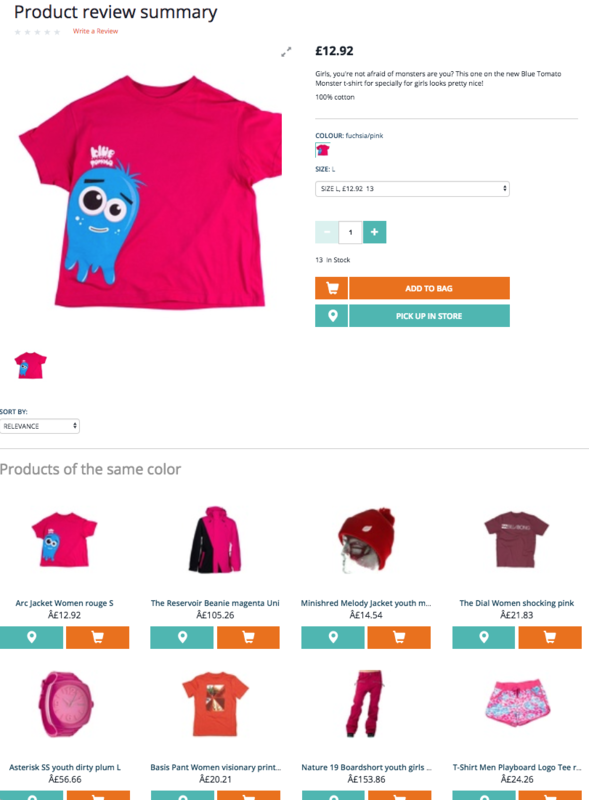 Wouldn’t it be amazing if you could just show your computer a picture or click on the current product picture and say, “Find all products like this”. 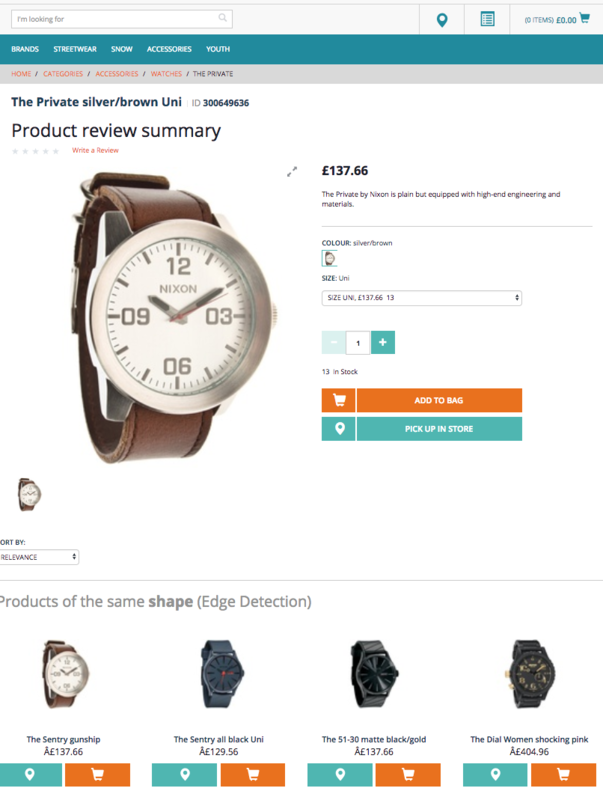 What is “similar-looking products”? It is a tough question as well. The common technique is creating a fingerprint for the images and compare these fingerprints. Similar images have similar fingerprints. It reduces the complexity and makes the system able to work with thousands or millions of images. 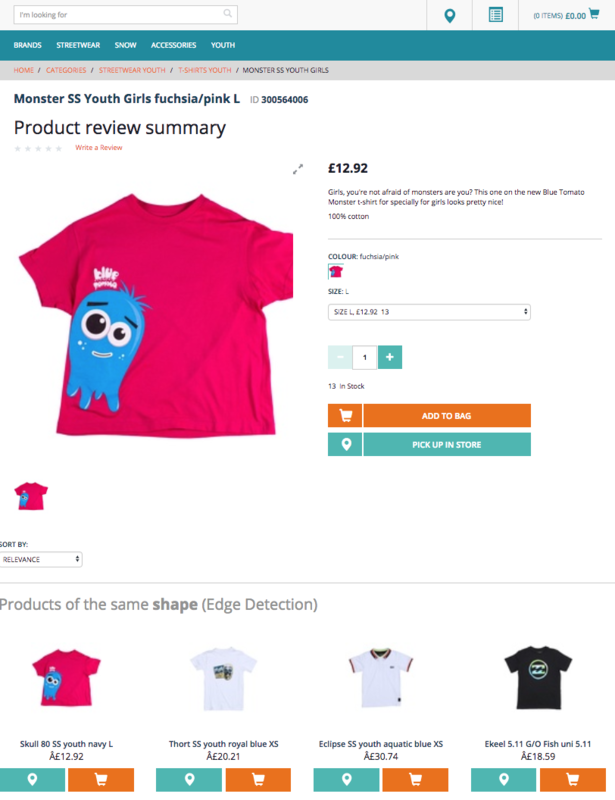 Today we will talk about products similar because their pictures are similar. Namely, they have visual similarities, e.g. 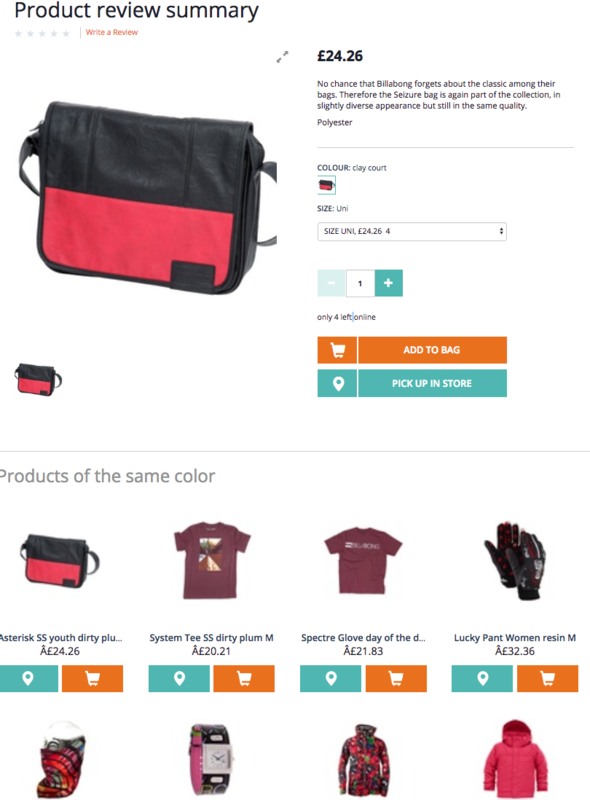 the predominance of some colors and almost identical color layouts. There are a lot of algorithms for calculating image fingerprints, and a lot of implementations of these algorithms. Basically, both the simplest systems and complex AI and machine learning software use the concept of image fingerprints, creating a set of numbers representing an image. There are many image fingerprint systems available on the market, such as pHash, imgSeek, WindSurf, libpuzzle, ImageTerrier or LIRE. The great list of such tools is on Wikipedia here. There are different algorithms and implementations. I experimented with the last library from this list, LIRE. Eventually, I needed to integrate it with hybris Search, so it was a big advantage that Lire has a module for Solr. It greatly helped me to create a proof of concept in a short time. LIRE had released in 2006 under GPL. The name LIRE stands for Lucene Image REtrieval, so it had a good foundation from the very beginning for integrating with Solr, which is based on Lucene. Now LIRE is a stable project with a strong community of contributors. The important feature of LIRE for me that it is written entirely in Java and can be integrated with SAP Hybris. However, LIRE has some drawbacks too. It does very rough similarity because it is mostly based upon color usage. It re-ranks the search results retrieved in full (up to 10000 which is configurable) even if you request only first ten items, that means that it may work much slower on large datasets than you may expect. Another product from the list, imgSeek, open source and free, is a good alternative, to some degree. 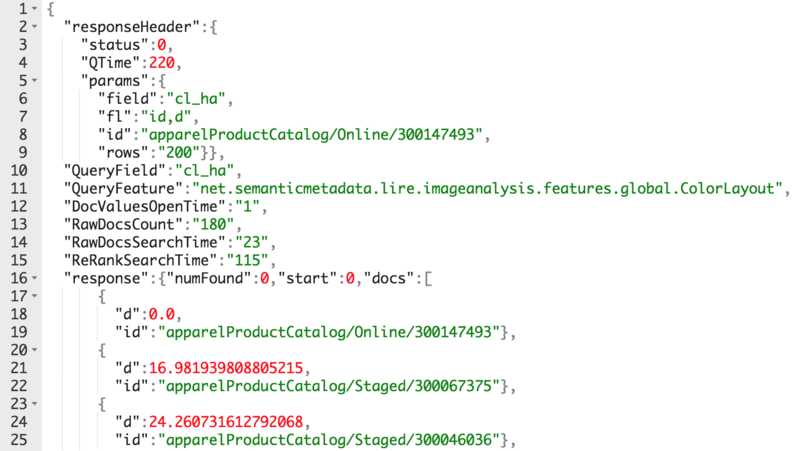 It analyzes the images, stores them in its own index, and provides you with a query interface. This will not be integrated with your SOLR instance and you’ll have to do two separate queries. imgSeek uses QT and ImageMagick, implemented in Python 2.4, so it cannot be well integrated into the Hybris search subsystem as I wanted. There are external commercial services, such as Match Engine from TinEye, for example. So, let’s come back to LIRE-Hybris integration. First, let me give you a bit of theory on how similarity and image fingerprints work. It is necessary to understand the details of the integration. The common approach of image fingerprinting is representing the image using the minimal amount of information needed to encode its essential properties. This minimal information is called image descriptor, and the process is known as feature extraction. The key idea of the approach is to use a function that maps images into an n-dimensional Euclidean vector space (R^n) such that similar images are mapped to points close to each other and dissimilar images are mapped to points far away from each other. 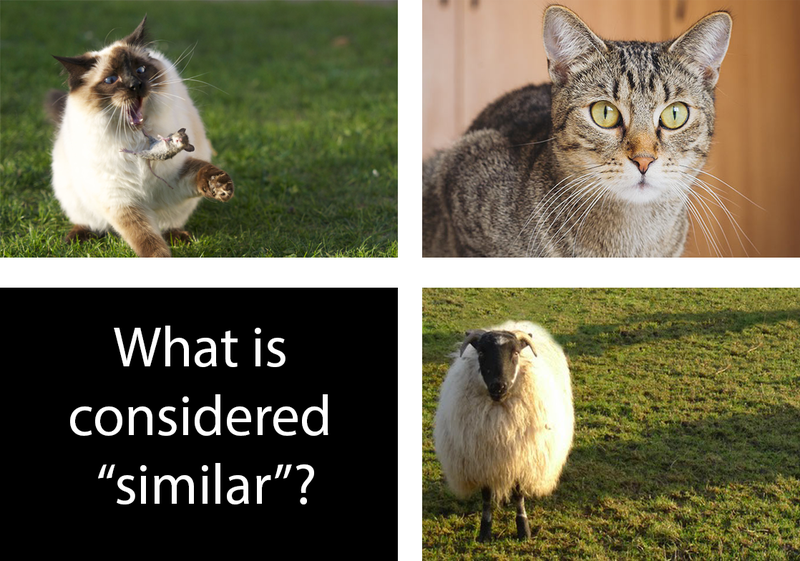 A vector distance such as the simple Euclidian vector distance then provides a similarity metric that can be used to determine which images are more similar to each other. The smaller the distance value, the more similar the images are. To build the result list for our sample application, we just need to sort the array containing all the images in a directory by their distance to the specified search image. 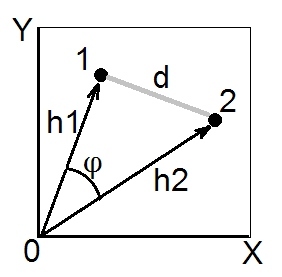 Vectors that represent images are called feature vectors. 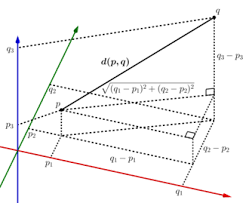 Feature vectors have much more dimensions. For example, “Color and Edge Directivity” (CED) is 54 bytes long, so it defines a vector in 54-dimension space, and this vector represents an image. Another popular method is MPEG7 standard image descriptors and FCTH (Fuzzy Color and Texture histogram). These descriptors have the desired properties (visually similar images are mapped to close points in an n-dimensional vector space). The optically similar images get assigned a similar feature vector, and the optically dissimilar images get assigned a very different feature vector such that the Euclidean distances between the vectors assigned to the first two images are smaller than the Euclidean distances between the vectors assigned to the first two and the third image. Different algorithms create the vectors differently. Simply put, it represents the spatial distribution of the color in images in a compact form. The image is divided into 8×8 dicrete blocks and their representative average colors in the YCbCr color space are extracted. The descriptor is obtained by applying the discrete cosine transformation (DCT) on every block and using its coefficients. The produced descriptor (=fingerprint) is a 3×64 representation of the image. By the way, image partitioning into blocks, the DCT transformation and zigzag scanning are used in JPG format. It represents the spatial distribution of five types of edges in the image. An image is subdivided into 4×4 subimages and the local edge histogram of five broadly grouped edge types (vertical, horizontal, 45 diagonal, 135 diagonal and non-directional) is computed. As a result, the descriptor is 4x4x8. So this method is used mainly for describing the shape features. For each type of edges there are corresponding filters. The technique counts occurrences of gradient orientation in localized portions of an image. This method is similar to that of edge orientation histograms, but differs in that it is computed on a dense grid of uniformly spaced cells and uses overlapping local contrast normalization for improved accuracy. 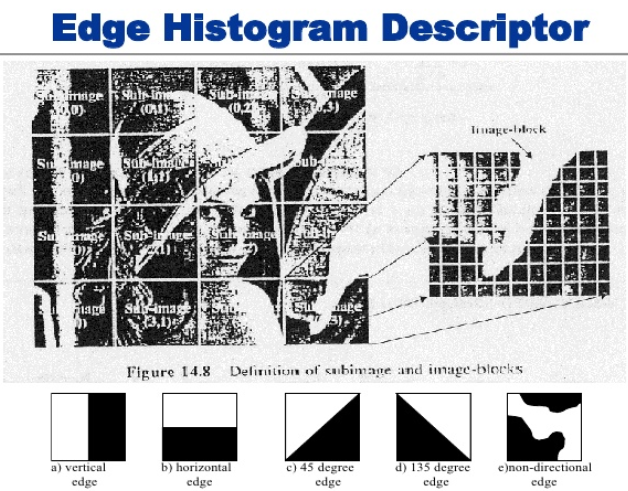 The essential thought behind the histogram of oriented gradients descriptor is that local object appearance and shape within an image can be described by the distribution of intensity gradients or edge directions. 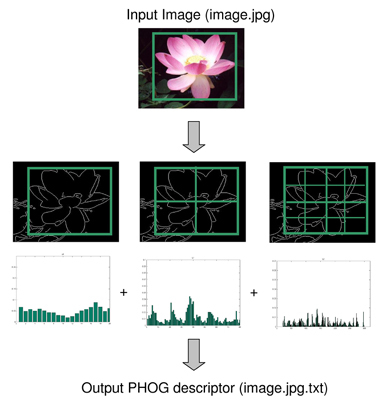 The image is divided into small connected regions called cells, and for the pixels within each cell, a histogram of gradient directions is compiled. The descriptor is the concatenation of these histograms. Color Correlogram Algorithm expresses how the spatial correlation of pairs of colors changes with distance. Informally, a correlogram for an image is a table indexed by color pairs, where the d-th entry for row (i,j) specifies the probability of finding a pixel of color j at a distance d from a pixel of color i in this image. An autocorrelogram captures spatial correlation between identical colors only. Color and Edge Directivity Descriptor Algorithm (CEDD) combines a 24-bin fuzzy color histogram with 6 types of edges (see edge histogram descriptor above). After extraction, the set is normalized and quantitized. The results in an overal descriptor length of 54 bytes, so it is compact. Fuzzy Color and Texture Histogram (FCTH) uses the same fuzzy color scheme as CEDD, but it has a more extensive edge description method. It is also more accurate, but less compact than CEDD. A combination of CEDD and FCTH is the Joint Composite Descriptor (JCD). All three are robust to scaling and rotation. Color layout and edge histogram are robust only to scaling. OpponentHistogram is a simple color histogram in the opponent color space (luminance / red-green / blue-yellow). Add a value source function. Allows for ranking based on the distance function. Added to text based search queries. For example, it can be used for sorting with the normal select query solr request. Compile lire library (gradle distForSolr) and copy dist/*.jar to hybris/bin/ext-commerce/solrserver/resources/solr/7.4/server/server/solr-webapp/webapp/WEB-INF/lib. In the last fragment, there are definitions for BitSampling and MetricSpaces. binaryDV is used for storing the feature vectors for different algorithms. BitSampling is a basic hashing method. It regenerates hashes to save space on the fly instead of storing them in the index. MetricSpaces is the proximity approach based on the work of Giuseppe Amato. While it’s actually not a hashing routine it’s an easy way to use it within LIRE. Based on a pre-trained set of representatives, the features of the representatives are stored in a text file. For indexing and search, they can be used to create hash like text snippets, that are then used to search & index. The goal of this process is to enrich the products in SOLR with the information about the product picture, namely, with the image vector. In hybris, we need to extend the indexing subsystem to add extra fields to the indexing request. the list of featureAlg is configurable. I used ColorLayout.class, EdgeHistogram.class, JCD.class and PHOG.class with the featureAlg codes cl, eh, jc and ph respectively. The listed classes are part of LIRE library. So, for 4 algorythms you will have 12 additional fields in the request. 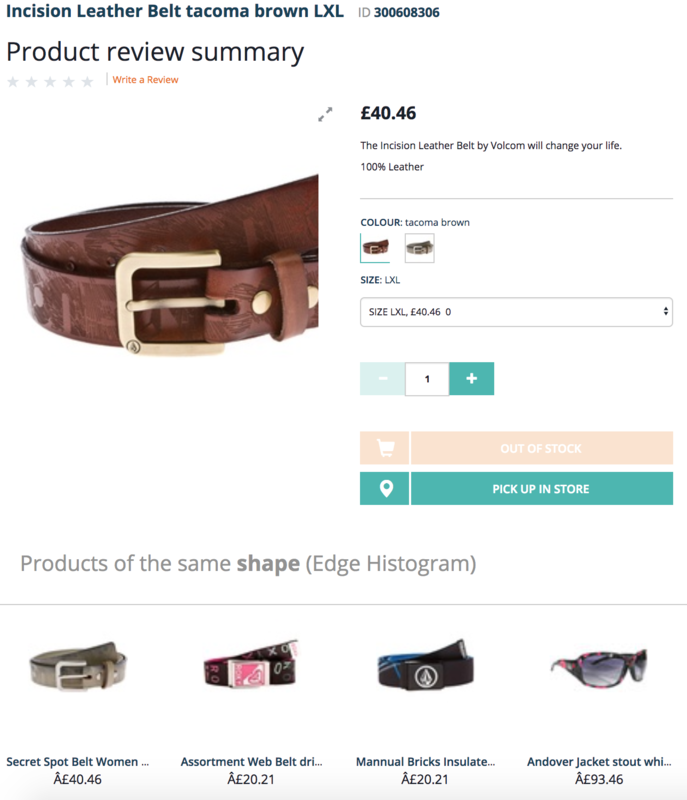 You can parse it and show with the custom recommended products component. The request above is not standard, it uses a separate request handler (/lireq). The request handler re-rank the results received from Solr. If you request first five products, internally it will request Solr for the much larger amount (by default, 10000 candidates) and re-rank them, and trim the results to the specified value (in “rows”). Lirefunc function can be used together with a standard select request which is normally used by hybris. Optional maximum distance for those data items that cannot be processed, ie. don’t feature the respective field. Note that if you send the parameters using an URL you might take extra care of the URL encoding, ie. white space, the “=” sign, etc. With this option, I faced the issue: lirefunc deals only with items returned by select. If it is a small subset of all items, the results won’t be sorted properly. I hope it is a misconfiguration on my side. For large sets of images, the solution above may be too slow because of per-request processing of all images. 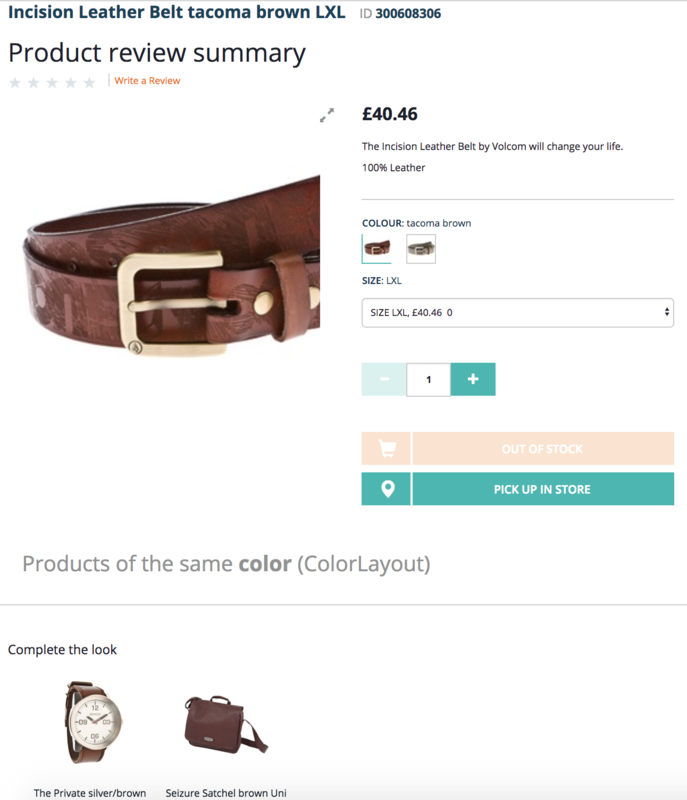 Possibly, you want to precalculate the recommendations (products of the same color) to make it much faster. However, for the generic task, the performance issues are inevitable if your dataset is getting bigger and bigger, even with such optimization techniques as locality sensitive hashing, used in the current solution (BitSampling). Secondly, you need to double check what feature vectors are really important for you to be in the index. Each additional vector may add gigabytes to the index size, and, as a result, slow down both indexing and searching. Thirdly, this task can be solved with machine learning algorithms too, with use of enhanced algorithms for feature extraction, such as SURF and SIFT. However, this has to be left for another day.